Let's get started on a painting of a white swan. I took a picture at our local zoo many years ago of a few swans swimming around in a pond. I isolated the one that had a good reflection. For the first step, I drew in the swan on a toned 6" x 6" gessobord with purple. 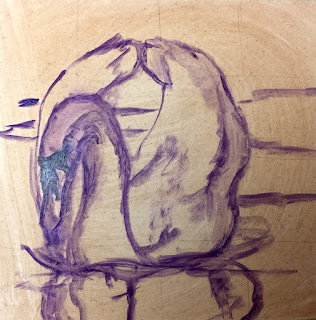 I used purple because it will blend in with the shadowing on the white swan. 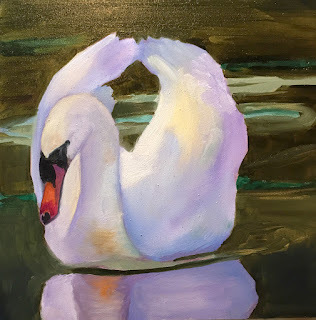 For the next step, I painted in the darkest shadow colors on the swan. I am using purple, cerulean blue, sap green and ultramarine. I also start putting in the light areas of the water. 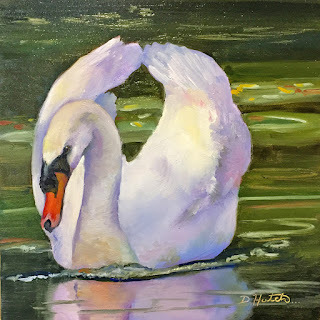 Next I paint lemon yellow and white on the sunlit areas of the swan. Put some white on the rest of the unpainted areas and with a soft brush, I blend the colors. The background gets painted next. I have used varying mixes of olive green and ultramarine. Note the orange in the reflections. The swan looks dark against the light background, but look how light the swan looks against the dark background. Now for the details. The water gets lightened to make the movement. 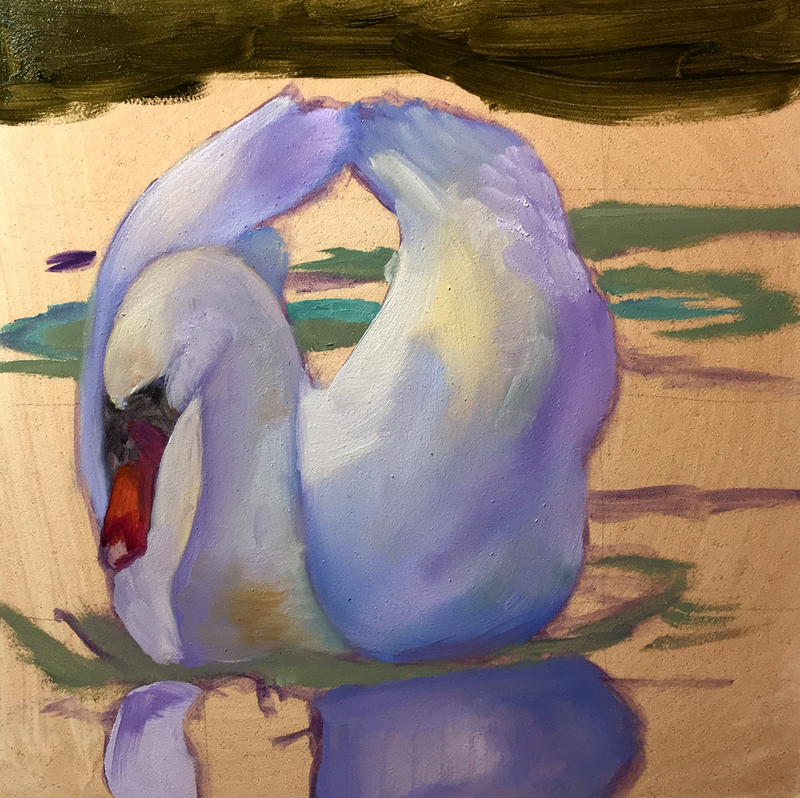 Little adjustments are done to the swan. 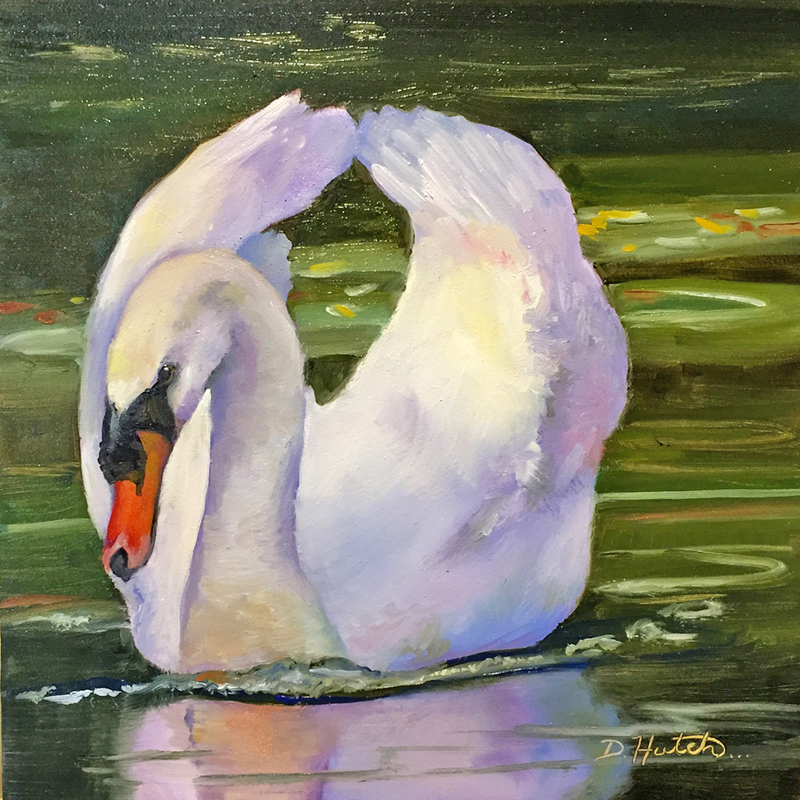 A few feathers are added to the wings with white and some wave action in front of the swan. And of course the eye and bill get some attention. 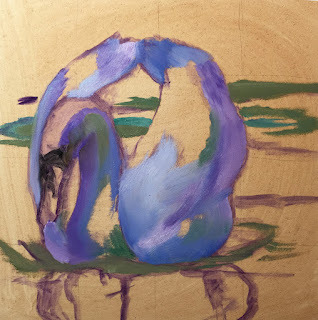 I will post this swan painting on DPW in the future after it has a chance to dry. Sometimes after the painting has dried, the finish is uneven or maybe a glaze needs to be added to enhance a color. I will wait and see. If you want to follow along on my next painting, please sign up on my email list.